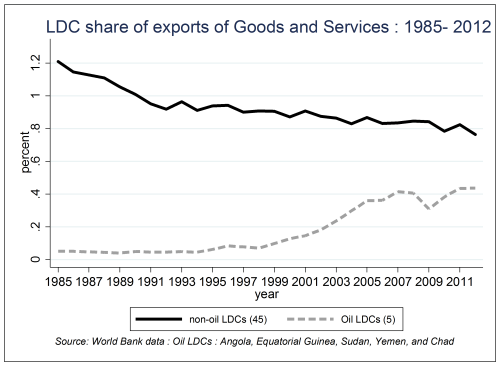 The 45 non-oil Least Developed Countries (LDCs), mostly African countries, are continuing to lose market share in world exports. For them, and for many developing countries, the World Trade Organization (WTO) agreements they signed as part of the “single undertaking” of the Uruguay Round were rules derived from international conventions developed by industrialised countries that were well beyond their needs in their current stage of institutional development. They were dubious that this “rules-based” globalisation would be the engine for growth and poverty-reduction that it had been for East Asian economies, most recently China. The 2005 Aid for Trade initiative (AFT) was created to provide financial and technical support to help developing countries, particularly LDCs, to build the needed supply-side capacity to ”implement and benefit from WTO agreements” with the aim of regaining market share and meeting the Millennium Development Goals. The scaling up of aid was to adhere to the so-called Paris Principles (ownership, alignment of aid with national priorities, coordination among donors, and a focus on results and mutual accountability). A recent e-book by the Center for Economic Policy and Research (CEPR) and the Fondation pour les Etudes et Recherches sur le Développement International (FERDI) critically reviews the evaluations of aid-for-trade activities carried out by donors and by the OECD-WTO biennial task forces. The study concludes that while the initiative helped arrest the decline in aid by mobilising resources, the focus of the biennial reviews was more on discussing results rather than showing them. The achievements of the AFT initiative are now at risk as development budgets come under increasing pressure. The recently signed Trade Facilitation Agreement (TFA) in Bali in December 2013, which recognises the need of Aid for Trade for developing countries and calls for assistance in capacity building, particularly for LDCs, provides the needed impetus to supply evidence about AFT’s effectiveness. That is, to narrow down the focus of AFT activities and to identify the measures that will contribute most to reducing red tape and increasing predictability in customs clearance (fees, formalities, transit). An increasingly large toolkit of impact evaluation methods – many drawing on existing data – provide the means for doing so. These methods will also help answer questions that will arise when implementing the TFA. For example, we do know that, after controlling for a host of other factors that determine trade, all components of trade costs, however measured, reduce the volume of trade and that is it is the non-tariff components of trade costs at the heart of the TFA that matter most. We also know that 85 percent of AFT funds go to finance hard infrastructure projects. However, we still do not know whether funds should go to build more roads, to rehabilitate them, or to improve competition in service provision. Neither do we know whether scarce funds should go towards reducing transport costs or towards customs reform. In addition, it is also unclear whether funds for customs reform should go towards providing incentives for greater integrity or for computerising processes. As Olivier Cadot and I demonstrate in the e-book, trade merits receiving aid. This review-based conclusion comes at a point when the longstanding controversy on trade as an engine of growth is coming to a close, with all recent work pointing to causation running from trade to growth (and thus to job creation and poverty reduction). However, debate surrounds the relative importance of “hard” vs. “soft” infrastructure, not least because causal links are tenuous, as trade-cost proxies are ad-hoc averages of indicators which, more often than not, measure intermediate outcomes rather than project or policy levers. Drawing on recent studies, Cadot and I then discuss the possibilities for improved evaluation from the growing toolkit of impact-evaluation techniques. Also in the e-book, Richard Newfarmer distils the lessons from the large collection of case studies and project narratives either supplied to donors or to the OECD-WTO reviews. In spite of a growing number of mentions of “trade” in budget speeches, case-study visitors often found that people in-country had no knowledge of AFT and that its wide definition made it difficult for evaluators to draw boundaries around their projects. Among the case studies, only Colombia and Rwanda relied on systematic monitoring and evaluation systems. Paul Brenton and Ian Gillson also provide an evaluation of the Enhanced Integrated Framework (EIF) where the push for integrating the LDCs into the WTO-based world trading system started. They review lessons from a decade of Diagnostic Trade Integration Studies (DTISs) and suggest ways to strengthen the process. First, with the sharp reduction of the visible policy barriers that distort incentives, modern trade policy now spans a wide range of issues under the purview of many ministries. The Trade Ministry that houses AFT activities lacks the clout to set up any effective coordination mechanism. Second, the trade-off between the objective of shared ownership, which may imply treading lightly on sensitive issues, and that of laying bare all issues, obscures the political economy issues that would help understand stumbling blocks to implementation. Last but not least, they note that DTISs have been carried out at the national level while many issues (e.g., food shortages during the crisis) call for regional cooperation. The e-book concludes with suggestions to help establish the effectiveness of the AFT initiative. First, donors and governments should concentrate on the TFA, which requires measures to increase the transparency of trade that are sufficiently well-defined to be subjected to evaluation. For example, does prior publication and consultation or advance rulings make a greater difference? What impact can one expect from implementation of the revised principles of the Kyoto convention (1974) for simplified formalities for transit? Second, in Sub-Saharan Africa where the returns on successful regional integration are the highest across countries and along many dimensions (resource-rich and resource-poor, landlocked and coastal, large and small), future DTISs should be coordinated at the regional level to help realise the gains from deeper integration to internalise regional spillovers. Third, and perhaps most importantly, since resources are concentrated in low-income countries with limited institutional capabilities, permanent, but implementable monitoring and evaluation procedures should be put in place without creating additional structures, as has already been done among some recipients. Only with an improved implementation record will private sector participation – needed for ownership – take place. A version of this blog appeared on Brookings Institution. Jaime de Melo is a member of the E15 Expert Group on Trade, Finance and Development. He is an Emeritus professor at the University of Geneva, the Scientific Director of FERDI, a non-resident fellow of the Brookings Institution, and an invited professor at the Johns Hopkins University Bologna Center.